On this day (Aug. 22) in 1892, Ben Sanders threw a no-hitter to beat Baltimore. So who was Ben Sanders? It must have been efficient, though. According to an article in Sporting Life, Sanders set the record for fewest pitches in a game with 68 in a win over the St. Louis Browns in 1891. Sanders was first noticed by the big league managers while pitching in Altoona, PA. 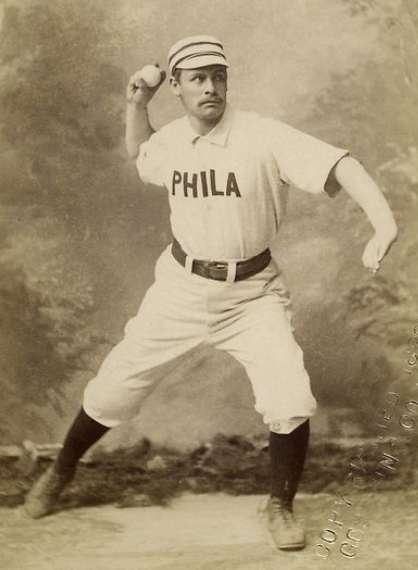 Signed to pitch for Philadelphia, he would win 19 games both seasons with the Phillies in 1888 and 1889. In his rookie season, he threw a league leading eight shutouts. Like many, he jumped to the Player’s League in 1890 and won 19 more games there in 40 starts. The Player’s League folded after that one season, though, making Sanders a free agent. The Phillies thought they would get Sanders back for 1891, but he was now finishing a civil engineering degree at Vanderbilt (as well as playing football and baseball – amateur athletics not being as well defined then). Instead, Sanders held out for the best deal and then pitched the rest of the 1891 season with the Philadelphia Athletics in the American Association, getting paid at least $5000 for a partial season, which made him the highest paid pitcher (per month, I am guessing) in the game. He went 11 – 5 in his 18 starts. Back in school for the 1891 – 1892 school session, he graduated in June and then made 31 starts for a poor 1892 Louisville team, finishing 12 – 19 but throwing a no-hitter against Baltimore. A contemporary article in the Louisville Courier-Journal says that the previous game had been a one hitter (not a no-hitter) vs. Baltimore, and he followed it with another one-hitter against Boston (Quinn – 4th inning ground single to left). His one hit in two starts would be the record beaten by Vander Meer nearly 50 years later. When the season was over, Sanders took a job with a prestigious engineering firm and retired from baseball. According to articles written while Louisville was still begging Sanders to play, he was among the engineers in charge of building the Chicago West Side Elevated Railway, invested in property in Louisville, and was involved in the engineering of the water works system of Morgantown, PA. He remained an engineer in Tennessee until his death in Memphis in 1930. “Out of Baseball”, Sporting Life, 30 May 1891, Page 9. “It Suits Louisville”, Louisville Courier-Journal, 1 Feb. 1892, Page 8. “Only One Missing.”, Louisville Courier-Journal, 26 March 1892, Page 7. “Brave College Boys.”, Louisville Courier-Journal, 2 April 1892, Page 8. “Hurrah For Sanders”, Louisville Courier-Journal, 27 August 1892, Page 8. “Editorial Views, News, Comment”, The Sporting Life, 17 September 1892, Page 2. “Has Given Up Ball Playing For Good”, The Sporting Life, 18 Feb. 1893, Page 4. McKee, Jr., Sam. “Louisville Lines”, The Sporting Life, 23 December 1893, Page 3. Saunders, John J. “Will The Prodigal Return”, The Sporting Life, 1 February 1896, Page 3. Richter, Francis. “Ben Sanders in Luck”, The Sporting Life, 6 April 1895, Page 7. Saunders, John J. “Louisville Lines”, The Sporting Life, 2 January 1897, Page 2. “Remarkable Performances”, The Sporting Life, 27 January 1912, Page 5. Nemec, David, Major League Baseball Profiles 1871 – 1900, Vol. 1, University of Nebraska Press, 2011, Pages 161, 162.